On Tuesday, February 13th volunteers packed 150 backpacks from our partner Olympia USA with toiletry items, nutritional snacks and bottled water. Eyes Not Forgotten would like to personally thank all volunteers who attended and to all those who made a donation. We will be donating these bags on Wednesday, February 28th at The Weignart Center in Skid Row, Los Angeles. This project is similar to our recent project in LA. In December of 2017, Eyes Not Forgotten partnered with The Weingart Center's transitional residential programs. After a successful project and event, ENF decided to plan a project around one of their other programs, AmeriCorps's Hope for the Homeless Program. "We make a life by what we give"
On Thursday night, December 15th volunteers packed 200 backpacks with toiletry items and nutritional snacks. These backpacks will be donated on Monday, December 18th to clients at the The Weignart Center, a comprehensive human services center for homeless men and women living in Skid Row, Los Angeles. On Thursday, November 2nd the founders drove to Olympia USA's headquarters in Torrance, California to pick up 200+ backpacks that will be used for our second project in Los Angeles. 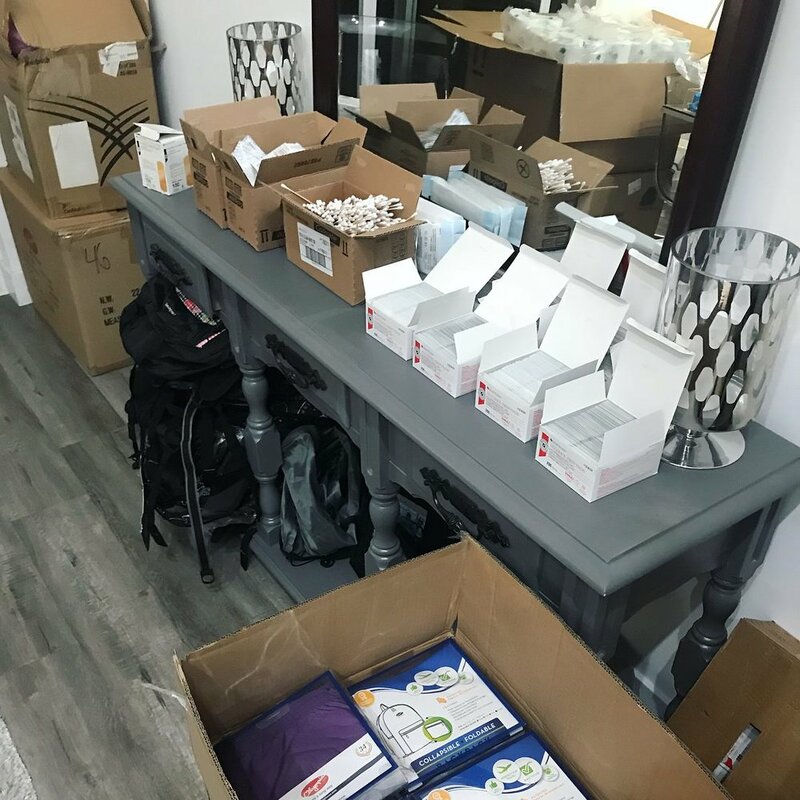 Eyes Not Forgotten will be filling the bags with toiletry items and nutritional snacks to be given out to the homeless in LA around Thanksgiving. Thank you Olympia USA for partnering with our organization (again) to positively impact the lives of others here in our own city. Erik and Charles went to Staples last Thursday, August 10th to purchase school supplies needed to fill the remaining backpacks. While there, a really amazing encounter happened. Erik and Charles were in the checkout line when a lady and her daughter asked why they were buying so much. They then told her about Eyes Not Forgotten. The mother gave Erik and Charles $20 and she also suggested an idea for a service project. The lady's daughter goes to a private school in Los Angeles; the mother suggested partnering with ENF for a Thanksgiving food drive with her daughter's school. The organization looks forward to this potential opportunity! That evening, ENF packed the remaining 145 backpacks. The organization wants to thank the friends and board members who attended and volunteered. Tonight, board members and friends packed backpacks with school supplies from our partner, Olympia USA. The bags will be sent to a grade school in Jutiapa, Guatemala as part of the organization's first project. Check out a video from this evening here. We still need more supplies! We packed 145 of the 300 backpacks. If you are able to donate, please visit our website. We will use the funds to purchase supplies for the remaining bags. If you live in Los Angeles, you can donate supplies directly. We need notebooks, colored pencils/markers and pens or pencils (unsharpened). ENF is a 501c3 nonprofit. Donors can deduct their contributions under IRC Section 170. The organization held a private launch event on Saturday, July 22nd. The event was a success! The founders would like to thank those who attended, donated and who were there for the presentation. If you feel compelled to donate, please visit our website. Every little bit helps! It is rare that a talkative person like me is at a loss for words, but today I was speechless. Erik and I drove to Torrance, California to meet with our new partner, Olympia USA. We drove around to the back of the building where three guys helped load our SUV with 300+ donated backpacks! When we took on our first project to help a grade school in small town outside of Jutiapa, Guatemala, we never imagined that we would bring on a large partner so quickly. We actually never imagined that our organization would be where it is today...just one month after our public launch. It's incredible and our organization is truly humbled. Erik and I would like to thank each and every one of you who are with us on this journey. We have big plans for Eyes Not Forgotten, but without friends and family it would not be possible. If you would like to contribute to the organization, please visit our website. We have more, exciting projects coming up! The founders want everything that the organization does and represents to have a good, positive meaning behind it, which includes the logo. When Charles was visiting Guatemala this year, he got to know Erik's cousin, Luis Jr. very well. This was the second time that Charles had met him. Luis is very creative and a great artist! Charles and Erik began deciding on what the logo would look like and who would create it. Their first thought was to reach out to a large company or to have a website help with the design, but it just didn't seem personal or meaningful. Luis creates artwork in Guatemala, so who better than to create the logo? Luis agreed to help and the organization is thrilled with how it turned out, from the eye design to the color (which also has a special meaning). Thank you Luis! You are now part of the organization. As mentioned in the Who We Are section of the website, the name “Eyes Not Forgotten” was largely inspired by the story of Park Yeonmi's journey out of North Korea. However, other experiences also influenced the name and the desire to create the foundation. Erik and Charles were visiting a town in Guatemala when Charles noticed a young girl sitting on a street corner; her eyes gazed into the distance. "It’s almost hard to put into words, but when I looked over at the young girl it was as if the world around us had been placed on pause. I was entranced by her. I wanted to know what she was thinking; I wanted to know her hopes and her dreams…I wanted to know what her eyes were seeing. I feel like I was meant to be there at that very moment, to let her mere presence change my life…because it did." We use our eyes to see, but often times we might miss the people who are right in front of us that need our help. Our organization is determined not to miss those people. Erik and Charles have decided to make it their life’s work to help others. They look forward to what the organization will become!